and precious like mountain water. what has been depleted. My hairline recedes. an object of athletic performance. halfway through a letter to a friend. than provocative, adorn innocuous fashions. of prosaic lines made up simultaneously. The north-wester plagiarises the mountain’s wistfulness. flail like the gale against my shirt. reveal nothing, merely an unpleasantness on the breath. scandals accumulate, like nicotine on the end of the finger. from smiles on unfamiliar faces on the street. or for addictive drugs. There’s no telling the difference. Grief is interred in legislated silence. on a line fastened to the loquat tree. Obese fruit flies raid the stamens of nascent buds. My daily chores are abandoned. Residues of soap powder stain my dark clothes. stretching under the armpit of the fabric. The city has dispensed with its graceless past. of unnatural lights, and the adhering sweat of trade. Mark Espin was born in Cape Town in 1964. 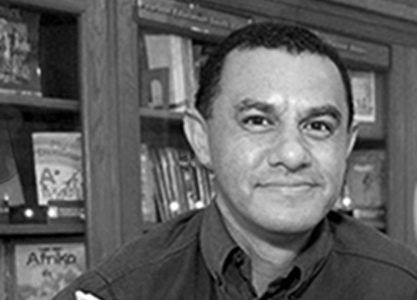 He is an Associate Lecturer in the Department of English at the University of the Western Cape. His first volume of poems, Falling from Sleep, was published by Botsotso Publishing in 2007.